The 504th/508th Prcht Inf in WWII & Beyond! Just found a few articles about Sergeant Major James O. Schmidt (Retired) today June 5, 2018. This is all based on an article done December 2015 by Gene and Jack Williams. It was published by The Southern California Sentinel. A very interesting article as it’s always nice to hear about a 3 Combat Infantryman Badge soldier. As always I like to verify information before going any further. This was an easy one as SGM Schmidt (Ret) is indeed one of the 324 soldiers at the Infantry Museum in Columbus, Georgia. After reading the Williams article “Tracking Down a Hero” I did a little research of my own. Sometimes things get a little mixed up when an article is being put together. Nothing major in this article but there were a few things that were incorrect. The first is that they have 325 soldiers listed as having 3 CIBs. The total is actually 324. On page three of their article they have SGM Schmidt (Ret) in a picture with another 508th Parachute Infantry soldier and have it identified as being from WWII. As mentioned in the William’s article he was in Headquarters Company 1st Battalion 504th Prcht Inf 82nd Abn Div in Sicily. There was a picture taken after Sicily and it shows SGM Schmidt (Ret) with a Purple Heart at the top of his ribbons. What isn’t there is the lack of the CIB. That’s because the CIB didn’t come into being until May 1944. So there were two pictures in the William’s article, one from the time in the 504th Prcht Inf and one after the war in the 508th Prcht Inf. The picture has the Eisenhower jacket and the man sitting in that picture doesn’t have a CIB it means this was when SGM Schmidt (Ret) was in Germany at that time period. Once again not a big deal but documentation and looking at the awards help to bring it more into focus. 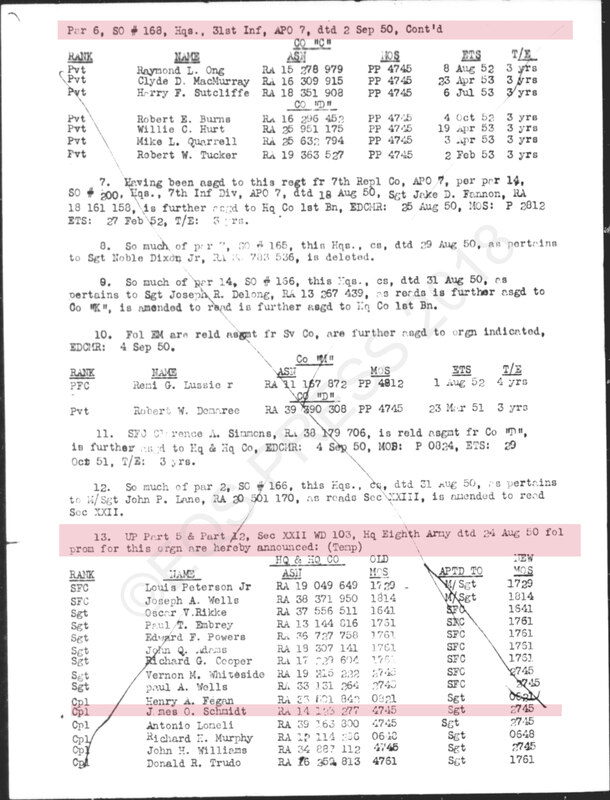 On page 4 they have SGM Schmidt (Ret) as being in the 187th Prcht Inf and in Japan. I’m not sure where he was but the 187th Prcht Inf would arrive in Japan September 22, 1950 so SGM Schmidt (Ret) wasn’t a part of the 187th Prcht Inf at that time. He was in the 31st Infantry Regiment in August 1950. (The word Regiment is assumed when part of a Division. So in this case it would be 31st Infantry 7th Infantry Division). Now, this is where the fun part of the research comes in. Attached to this narrative are 8 pages of Morning Reports that have SGM Schmidt (Ret) either listed or a part of what was going on for Corporal then Sergeant Schmidt in Japan then Korea. The first 4 pages show Corporal James O. Schmidt being promoted to Sergeant September 2, 1950. Sergeant Schmidt was in Headquarters & Headquarters Company 31st Infantry 7th Infantry Division. 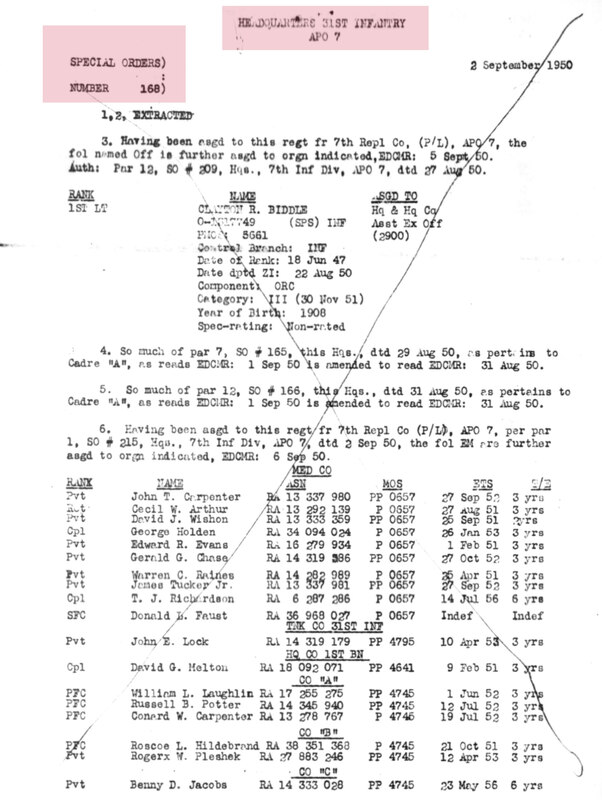 The next 4 pages of Morning Reports show Hq & Hq Co 31st Inf leaving Japan September 12, 1950 leaving by ship for Korea. They arrive at Inchon and debark from the USS Gen H. W. Rutner onto a LST September 19, 1950. They then move to Suwon then Sango’on between the 29th and 30th of September. There is on more bit of information about SGM Schmidt and his time in both the 82nd Airborne Division and the 7th Infantry Division. There is another 3 CIB soldier who was not only in the 82nd Airborne Division in WWII but also in the 31st Infantry 7th Infantry Division in Korea. That would be Colonel Robert E. Chisolm (Ret). Col Chisolm was in the 508th Prcht Inf in Co I and was wounded in Normandy on his 19th Birthday. He came back and went through the rest of the war in the 508th Prcht Inf. Col Chisolm (Ret) reenlisted in the Army in 1946 and guess what? He ended back up in the 508th Prcht Inf in Germany just like SGM Schmidt did. Then in Korea then 1st Lieutenant Chisolm became Company Commander for Co L in the 31st Inf 7th Inf Div in June of 1953. There are many parallels between the two men including they both received their 3rd CIBs in Vietnam as a Paratrooper. You never know what might be lurking around the corner when reading an article. After the Williams article “Tracking Down a Hero” was published in 2015 it was then picked up a few times. When that happens errors start to pop up. The next version was Airborne & Special Operations Museum Foundation March 3, 2017. It took from the Williams article that had SGM Schmidt in the 187th Regt in Korea. The original William’s article had him being in Japan in the 187th Inf Regt but now they have him listed as being in Korea. That would make people think that SGM Schmidt must have jumped in Korea. I sent a message this morning letting the Airborne & Special Operations Museum Foundation letting them know about the error. The next magazine that picked up on the Williams article “Tracking Down a Hero” was Stars & Strips which published an article March 7, 2018. Stars & Stripes has a few errors including this “1st Brigade Combat Team”. There is, of course, no such thing. I think they tried to say the 504th Prcht Inf Regimental Combat Team (RCT). The magazine also talks about the cricket. That hadn’t yet come into use in Sicily. The last publication to write about SGM Schmidt was War History Online. They almost always have errors in the WWII articles. The War History Online have him jumping when he was 14 when in fact he was 15. They also picked up the 1st Brigade Combat Team error from Stars & Strips. War History Online has a big error when they say that when he joined the 508th Prcht Inf Regt that the war was still going on. Of course the war was over May of 1945 in Europe and SGM Schmidt (Ret) joined the 508th Prcht Inf June of 1946 a year after the war ended. It would be nice if before publishing an article fact checking would be done but that seems too much trouble in today’s world. The original article “Tracking Down a Hero” was an interesting read. Glad I just discovered it today, one day before the 74th Anniversary of Normandy.